How high are realtors´ and lawyers´ fees in Hungary? What about other property purchase costs? How difficult is the property purchase process in Hungary? To purchase any type of land except arable land, a private person needs a permit from the district council of the local municipality, and in Budapest any purchase of property is subject to the approval of the Administrative Office (AOB). No restrictions apply to ownership of property by Hungarian legal entities. Hungarian law requires that real estate purchases shall be concluded through private contract (purchase agreement) countersigned by a lawyer. Non-Hungarian citizens are further obliged to gain the approval of the relevant Administrative Office (KÃ¶zigazgatÃ¡si Hivatal) in order to purchase property as a private person. According to regulations most foreigners should receive a permit within 2-3 months. Once a property has been chosen, negotiate (agents usually over-value their listings). It highly recommended that a lawyer/solicitor be employed for the conveyance. Note that this lawyer does not represent only the buyer but also the seller, though the former pays for his services. Title searches are usually included in the services lawyers offer, so check. A structural and/or architectural survey of the apartment and building are recommended. When an agreement is reached between the buyer and the seller, the lawyer will start the process of securing local government approval of the purchase (unless the buyer is setting up a company). Title search and property valuations are then set in motion. When the title has been declared clear from encumbrances, the purchase agreement is drafted by the lawyer. This written contract, countersigned by the lawyer, is necessary to validate the transfer of property. A meeting between the seller, buyer, and lawyer is then arranged, at which the contract is signed in the presence of the parties and a representative of the real estate office. Now the buyer is expected to hand over 10% of the agreed price as down payment (deposit). After signing the contract, the buyer has to pay the lawyer´s and the agent´s fees. The purchase agreement has to be submitted to the competent land registry office within 30 days of signing. Because of the permission process, closing usually takes place 60-90 days after initially signing the Purchase Contract. The buyer must notify the seller immediately after receiving the purchase-permission from the Administration Office. Closing usually takes place within a week. The most important step is when the buyer and seller sign the Closing Statement, which is a declaration that the purchase price has been paid in full and possession transferred. The buyer then takes possession. The final registration of ownership rights takes about six months. Lawyers usually prepare all the documents and hand them in to the Court of Registry for a fee of approximately HUF150,000 (€484). Specimens of signature cost HUF1,500 (€5) each. Four originals are required. An accountant is necessary to take care of filing a quarterly and yearly report to the tax authorities. The accountancy costs are approximately HUF75,000 (€242) per year. What steps to take to form a company? Have the articles of association notarized. This certifies the identity and signature of the Managing Director. Specimens of signature are signed in front of the notary, usually in four copies. Register the company. The lawyer gives the specimens of signature and the bank account contract to the Court of Registry. A statement is immediately issued certifying that the company is under registration, and a tax number is assigned by the tax authorities (APEH). The new company can now operate, issue invoices, and incur expenses. A few months later, notice of the full registration will arrive, and the company details will be published in a formal public record. Lastly, an accountant must immediately be entrusted with the books of the company. 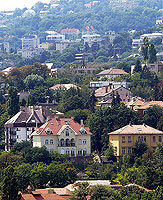 It takes an average of 12 to 63 days to complete the four procedures needed to register a property in Hungary. Generally, real estate transfers are subject to a 4% transfer tax. For apartments and houses, transfer tax is levied at progressive rates, from 2% to 4%. For residential property, only the first sale is subject to 27% Value Added Tax (VAT). The sale of land is also VAT-chargeable. Legal fees for the preparation of the sales contract are negotiable. In practice, it ranges from 1% to 3% of property value, plus 27% VAT. Legal fees are generally around 1% of the property value. Real estate agent´s fee ranges between 3% to 5%, plus 27% VAT. In private ads, it is still common to see provisions emphatically excluding the participation of real estate agencies in the transaction. Most sellers are reluctant to pay high brokerage fees. How landlord-friendly is the law in Hungary? How do the buyer fees add up to 28%? I see 2-4%, plus 1-3%, plus 1-3%, plus 0.01-0.05%.... roughly 4-10%?